Carrots are likely to have come from Afghanistan and Iran. Carrot subspecies have been selectively bred over centuries to reduce bitterness, increase sweetness and minimize the woody core. The first carrots were cultivated for their aromatic leaves rather than for their roots. By the way, “ancient” carrots were purple and gray, and orange ones appeared only in the 17th century in the Netherlands. 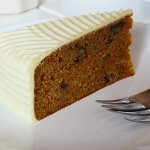 Carrot cake has been known since the Middle Ages. Sugar was very expensive art the time so people were looking for a substitution to flavor their cakes. They came up with the idea of using sweet vegetables, like carrots. Using carrots instead of sugar became obsolete for hundreds of years, until the British government rationed many foods, including sugar, during World War II and immediately after. It's hard to say “no” to sweet cakes, that is why the Ministry of Food promoted recipes of carrot puddings, carrot cakes and carrot-filled pies that were sweet enough and didn't require luxury food. Today carrot cake is a traditional dish on Christmas Day in many families in the UK. You don't have to wait for for Christmas to enjoy it. Treat yoursel to a slice of carrot cake on February 3, which is National Carrot Cake Day.